The aftermath of the CSX Bakken crude oil train derailment in Mount Carbon, W. Va.
March 11, 2015: A correction has been made to this story. In Pennsylvania, nearly 1.5 million people are in potential danger if a train carrying crude oil derails and catches fire, according to a PublicSource analysis. That is about one in every nine Pennsylvanians, or 11.5 percent of the state's population. The analysis also found 550 K-12 schools, 37 hospitals and 61 nursing homes in the state are at risk. These numbers take on new meaning in the wake of the recent calamitous derailment near Mount Carbon, W. Va. And, a federal report predicts 15 trains carrying crude oil and ethanol in the United States could derail in 2015 alone. On Feb. 16, the nation watched as blazing orange clouds of fire shot out of crushed tank cars in West Virginia from a derailed CSX train carrying Bakken crude oil. Fires burned for days, drinking water was affected, a house was leveled and hundreds were evacuated from their homes. The scene had many Pennsylvanians wondering: Will it happen here next? Fractracker, a group that vets data about fracking, and PennEnvironment, an environmental advocacy group, also published a map looking at crude-oil trains and population. Their numbers vary from ours because we used different methodologies and sources. PublicSource used the rail lines on which the railroads themselves reported to the state they are moving more than one million gallons of Bakken crude oil at a time. The railroads did not have to report lines where trains carrying less than one million gallons travel. Fractracker used a number based on the number of people who live near lines on which the oil could be moved. You can use this map to explore Bakken crude oil train routes within Pennsylvania. Use the search bar to zoom in and see whether your house, workplace or school is located within the federal half-mile evacuation zone. City and emergency response officials across Pennsylvania said they’re concerned about a derailment. Rick Molchany, director of general services for Lehigh County, said first responders in his county have attended state and national workshops run in conjunction with the railroads. “We’ve got the training and the determination…but, God, I hope we don’t ever have to respond,” to an oil train fire, he said. That was illustrated to an extent in West Virginia when firefighters were forced to let tank car fires burn for days before they were safe enough to extinguish. In May, federal regulators ordered railroads carrying Bakken crude to give their routes to Pennsylvania Emergency Management Agency officials. The PublicSource analysis shows those at risk within a half-mile on each side of rail lines in the state where trains haul more than one million gallons at a time of Bakken crude oil, which is highly volatile. 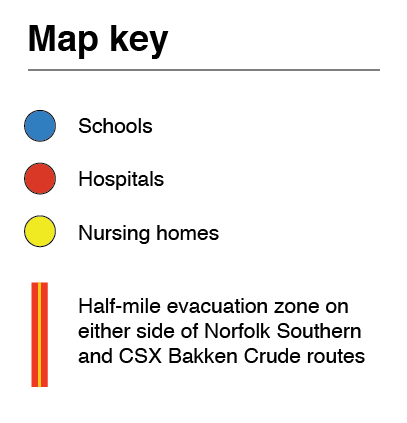 A half-mile is the federal evacuation zone recommended when a tank car of crude oil catches fire. There are no state or federal rules requiring that citizens be informed when these trains come through. And the railroads and emergency responders don’t share that information with the public, citing potential terrorism. What we do know is that about 60 to 70 trains each week carrying crude oil from the Bakken Shale in North Dakota and Montana pass through Pennsylvania on their way to Philadelphia and other East Coast cities with refineries. Because oil production shot up quickly in the last few years and because no one knows how long the boom will last, it’s unlikely new pipelines will be built soon, so crude oil will likely continue to be moved by rail in large amounts, according to a report from the Congressional Research Service. The West Virginia derailment, and one in Ontario on Feb. 14, are just the two latest accidents. At least 12 derailments have occurred since early 2013, the most devastating in Lac-Megantic, Quebec, in July 2013, when a runaway train carrying Bakken crude derailed and set off an inferno that killed 47 people. 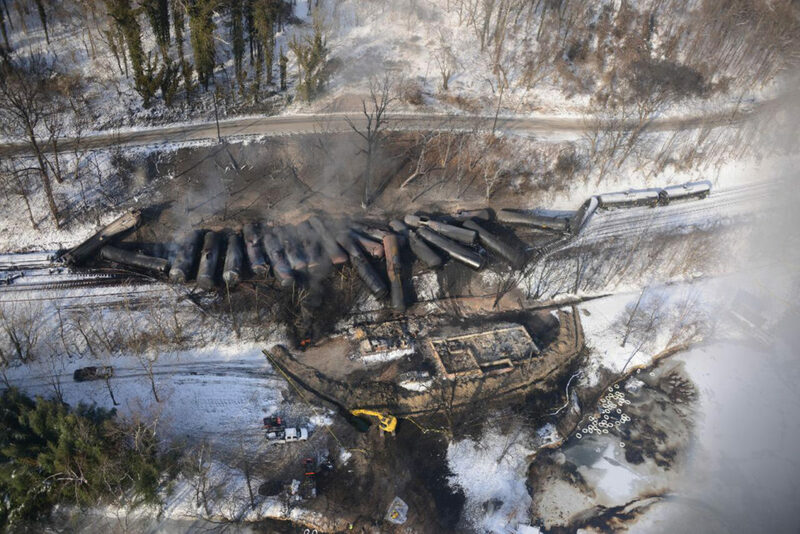 Since January 2014, Pennsylvania has had at least four derailments involving crude oil. None of them caused any injuries. The string of derailments has prompted officials, advocacy groups and citizens to call for tougher safety standards, including stronger tank cars, which U.S. regulators haven’t been able to adopt even as more derailments pile up. Regulators and railroads have taken other actions, including slowing trains down in urban areas, and requiring more track inspections and better braking systems. Representatives for Norfolk Southern and CSX both said they’ve increased training for first responders in the state. Regulating railroads is largely left up to the federal government so there's little local municipalities can do except make sure they're prepared. “Our hands are tied,” in terms of regulation, said Michael Huss, Pittsburgh's deputy director of public safety, on WESA’s Essential Pittsburgh radio show on Feb. 25. Huss said he'd like to see crude oil trains rerouted around Pittsburgh. "When you look at Pittsburgh...we don't have a refinery in the city and therefore I believe that material could be rerouted," he said. But rerouting trains around cities isn’t necessarily a good idea, Patricia Reilly, senior vice president of the Association of American Railroads, said on the show. Working with the federal government, railroads weigh many different factors when choosing routes, including population, terrain, class of track and weather conditions, she said. "Rerouting might sound like a very good solution, but the reality is rerouting those trains might mean moving it to track which is not the best track to move hazardous or flammable liquids," she said. Pittsburgh city officials recently completed a risk assessment of crude oil trains coming through the city and the Southwestern Pennsylvania region, but will not release specific information about it to the public because of terrorism concerns. Fred Millar, a Washington D.C.-based hazardous materials safety advocate, said the security excuse doesn’t hold up. “Any half-assed terrorist” can see where a good place to blow up a train would be in a major city, he said. In Philadelphia, activists and local politicians are pushing city emergency management officials to release more information on routes and safety plans for crude oil trains. "West Virginia's derailment is a horrifying reminder of what could happen in Philadelphia," Clean Water Action’s Mary Donahue said in a press release. Although regulating railroads falls under federal jurisdiction, states do have some authority. Gov. Tom Wolf is reviewing the policies in place for crude oil trains and has met with railroad executives to discuss how to lower the derailment risk, according to a Feb. 27 letter he wrote to President Barack Obama asking for speedier action on improving crude-by-rail safety. “The potential for disaster is too great to ignore,” Wolf wrote. The U.S. Department of Transportation has been working on new rail safety rules for more than a year, but the rules are stalled at the White House’s Office of Management and Budget. Wolf said current standards for tank cars and braking systems are “not sufficient.” He pointed out that newer tank cars built to more stringent standards, CPC-1232s, have still failed in derailments, including the recent one in West Virginia. He also asked for federal money to hire more rail safety inspectors, saying the state relies on only six inspectors to monitor 5,000 miles of track. The Pennsylvania Emergency Management Agency has focused federal grant dollars on training, said spokesman Cory Angell. And the Department of Environmental Protection is working with emergency responders in areas where crude oil trains travel near major rivers, said spokeswoman Amanda Witman. “This planning effort was started to specifically address high hazard freight by rail,” Witman said. She added that the effort, which started in June 2014, is not just focused on crude trains, but on trains transporting other hazardous materials. Correction: This story originally said that there were 327 K-12 schools in the danger zone. The correct number is 550. Reach Natasha Khan at 412-315-0261 or nkhan@publicsource.org. Follow her on Twitter @khantasha. Reach Alexandra Kanik at 412.315.0264 or akanik@publicsource.org. Follow her on Twitter @act_rational.